You might like to view the video "Mull of Kintyre"
In the following pages I essay to guide my readers to new ground, even to "the Land's End" of Scotland, — for such is the English meaning of the Gaelic word Cantire, Ceantire, "the Land's End," which is the southern part of the county of Argyle, and is a peninsula only twelve miles removed from Ireland, washed by the Atlantic, and flanked by the Isles of Arran and the southern Hebrides. I venture to call Cantire new ground, for in truth it is somewhat of a terra incognita, and is but rarely visited, and has been but barely mentioned by the guide-books, some of which indeed do not bestow any description upon Cantire, evidently regarding it as a "Western Highland district which no tourist would desire to explore. For, it is a country which must be visited for its own sake; and the traveller, in quest of Highland celebrities, need not, on his way to them, pass through Cantire. It lies south and west of the better-known portions of the Scottish Highlands; and although so many thousand tourists annually visit those spots which fashion has very justly pronounced to be so invitingly beautiful,—but which, rather more than a century ago (as they were hard to be got at), were deemed to be the types of all that was uninteresting and repulsive,— yet not even a driblet of this annual stream is filtered through Cantire. It lies out of the beaten track; it is somewhat of a journey to get at it, to get through it, and to get away from it; and, in these days of rapid locomotion, when the British tourist can breakfast in Glasgow, and "do" Dumbarton, Loch Lomond, Rob Roy's country, Loch Katrine, the Trossachs, and Stirling, within the limits of one summer's day, and can sleep in Edinburgh the same night, he can get more for his money and for his after-conversation out of such a tour as this, than he can do by going out of his way to see a district of the Highlands, which must consume at the very least three or four days of his time to get to and away from, and in which his home friends will probably not take the slightest interest. For the British tourist is a gregarious and sheep-like animal, and Brown's instinct leads him along the beaten track, where he is sure to meet with Smith, Jones, and Robinson, and where railways, steamers, coaches, and well-appointed inns fit into each other with ease and comfort. And thus, although the Western Highlands have been so much visited and described, the peninsula of Cantire has well-nigh escaped notice. It is true that when compared with certain other better-known districts, the scenery of the Land's End of Scotland must (in some particulars) take an inferior rank; but it only fails when put to the test of comparison; and after all this test is but a variable one, dependent upon the diversities of taste, and for all practical purposes next to worthless. Brown's remark, that the Fall of Foyers is a hundred times as. big, or ten times as stunning, as that tiny cascade in the glen which honest Smith is admiring with all his artistic heart and soul, is no real depreciation of the smaller fall. Nor ought the satisfaction with which Robinson, prone in heather, regards the Cantire panorama from his hill twelve hundred feet above the Atlantic, to be in any way damped by the sneer of travelled Jones: "Ah! you've never been up the Coollins!" "All is here that the -whole earth yields, Variety -without end; sweet interchange Of hill and valley, rivers, woods, and plains, Now land, now sea, and shores with forest crown'd, Kocks, dens, and caves." The "forest-crowned" shores are even found here and there, though the greater part of the sea-board is destitute of timber. The Mull of Cantire,—the veritable "Land's End,"—is peculiarly bare, and is for the most part a wild region of heath-covered hills, girdled by ragged rocks, against which the waves of the Atlantic, after their three-thousand-mile race, are dashed with a furious roar, that has been heard (so it is stated) at a distance of forty miles. The highest mountain upon the Mull is Cnoc Maigh, which attains an altitude of 2063 feet, and which has apparently been named Cnoc Maigh, or "the Hill of the Plain," on the lucus a non principle, as it rises from a confused pile of mountains, some of which are but little its inferiors in altitude, and from all of which the views are varied and magnificent. To the wildness of the scenery in the southern, portion of the peninsula, the soft beauty of the northern affords a marked and agreeable contrast, and the loveliness of West Loch Tarbert is like a confused memory of Loch Katrine and Windermere. But, whatever difference of opinion may exist as to the scenery of Cantire, there can be but one opinion as to its being a district which yields to no other in the Western Highlands both in interest and importance. Cantire was the original seat of the Scottish monarchy, and its chief town was the capital of the Scottish kingdom centuries before Edinburgh existed. It was the first part of Western Scotland where Christianity took root; for in Cantire St. Columba's tutor, and then St. Columba himself, preached the Gospel before it had been heard at Iona, or in any other part of the Western Highlands and Islands. From its nearness to Ireland it was subject to other invasions than those by the Danes; and from its being one of the chief territories of the Lords of the Isles, and having within its boundaries some of their most important strongholds, its soil was the scene of perpetual feuds and chronic wars. In the following pages these points will be found to be treated, I trust, with conciseness and clearness, but yet with sufficient fulness. My visit to Cantire was made during the months of August and September, 1859; and since then I have been at considerable pains to collect from reliable sources a large body of information, statistical and archaeological, on every point that would illustrate the history, antiquities, scenery, and characteristics of this interesting Highland territory of the Lords of the Isles, as well as the dress, manners, customs, sports, and employments of the inhabitants, together with, their moors and glens, their lochs and rivers, their towns, villages, churches, castles, farms, and cottage dwellings. In short, so far as in me lay, I have endeavoured to give a full and informing sketch of the peninsula and people of Cantire. 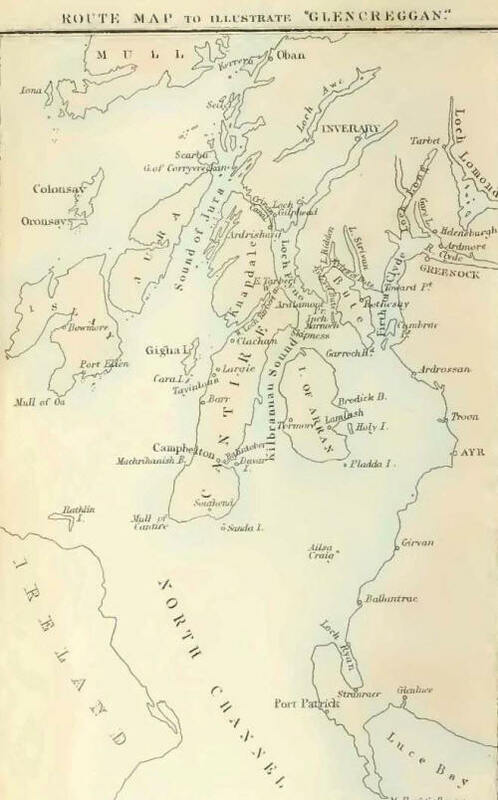 I have also added a description of the route to and from Cantire by the Firth of Clyde, the coast of Arran, Kilbrannan Sound, Loch Fyne, and the Kyles of Bute; together with a brief account of Islay and Jura, and those other islands of the Southern Hebrides that lie off the western coast of Cantire. My knowledge on many points must necessarily have been but slight and superficial, and I therefore gratefully pay testimony to the kindness of those Cantire friends who have so readily assisted me with information. I have acknowledged my obligations to them in various portions of my book; and I need here but mention the names of the Eev. Duncan Macfarlane of Killean, Keith Macalister, Esq., of Glenbarr Abbey, the Hon. A. H. Macdonald Moreton, of Largie Castle, and William Hancocks, Esq., of Glencreggan, without whose kindness and hospitality this book would not have had an existence. I would also wish to especially acknowledge my obligations to Mr. Peter Mcintosh, of Campbelton, for the greater part of those curious and characteristic tales and legends with which my descriptions are relieved. During a long and well-spent life Mr. Mcintosh has turned his attention to the collection and preservation of the fast-dying records of past customs and beliefs, and has been a pioneer in that movement which Mr. Campbell has so well inaugurated in his lately-published volumes of the "Popular Tales of the West Highlands," to which I have frequently referred in the following pages, although their mention of Cantire is confined to five brief passages. Greatly aided, therefore, by Mr. Mcintosh, with slight help from other sources, both public and private, I have been enabled to collect upwards of fifty popular tales relating to Cantire: the titles of the principal stories will be found (under the head of Story) in the Index which I have prepared for the book, and which, without being overladen with references, will I trust be found sufficiently compendious for all useful purposes. Cantire has hitherto been very imperfectly and incorrectly mapped, and it is hoped that the map given in the present work will be found to surpass its predecessors. If the truth must be told, it has given me more trouble than all the rest of the book. I compiled it from various sources, — my own observation, private charts kindly placed at my disposal, and the best published maps. The coast lines have been adopted from those in the Admiralty charts,—(" Scotland, West-coast; Sheets 2 and 3, — 1966, 2159 — surveyed by Captain Robinson;") and the mountain ranges and other portions are chiefly based upon Mr. Keith Johnston's large map of Southern Argyleshire, which (the Ordnance Survey not having mapped Cantire) is said to be the best map of the peninsula. There are many errors, however, in Mr. Johnston's map, and considerable differences and discrepancies will be found on comparing his' map with that in the present work. This is notably the case with regard to the names of places, and in this respect I. encountered considerable difficulties. Scarcely any two maps agreed upon this point, and when I went to original authorities, and to people upon the spot, the Gaelic name has been spelt for me by my Celtic informants in so many different ways, (owing chiefly to the variations in dialect) that after all, I have had to choose between several varieties, and to select that name which seemed to me to have the best title for correctness. In this dilemma, I have generally been guided by the author of the " Statistical Account" of each parish, who, from his local knowledge and acquirements, could speak on this point ex cathedra. I also received the valuable assistance of Mr. Edward Weller, F. E. G. S., under whose careful superintendence the map has been engraved. A Route Map, and a Geological Map, have also been added. For the latter I am indebted to the kindness of an eminent geologist, whose name (were I allowed to mention it) would be a sufficient guarantee for its correctness. That it greatly differs from Macculloch's map is attributable partly to the older map being limited to "the general features" of the Cantire geology, and partly to the science having been somewhat revolutionised since Macculloch's day. With regard to the Illustrations, those in colours have been copied in chromo-lithography from my large water-colour drawings, a task which has been performed by the Messrs. Hanhart, with great skill and fidelity, to my own satisfaction, and I trust, to the gratification of my readers, who will be enabled to judge from them, better than from any verbal description, how wild and picturesque is the scenery of Cantire. The woodcut illustrations (engraved by Mr. Branston) are from my own sketches, assisted, in a few instances, by photographs specially taken for this work. The greater part of the landscape illustrations have been drawn upon the wood by Mr. J. Willis Brooks, and are denoted in the Lists of Illustrations prefixed to the volumes. For all the other woodcuts I myself am answerable.